Double Tops, also alternately referred to as Sandwich, Honeycomb, or Composite tops, are a method of using relatively modern technology to produce a soundboard that is lighter, stifer, and more stable than what can be found naturally. Pioneered by German classical guitar builders Gernot Wagner and Mattias Dammann (no relation), these soundboards use two very thin layers of cedar (or spruce) that are separated by a layer of resin-impregnated paper honeycomb. 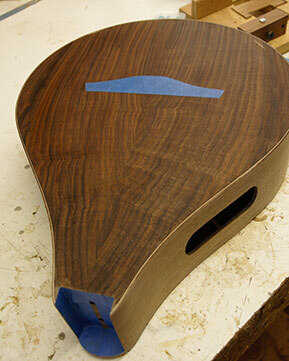 A double top soundboard is not only is lighter overall (typically reduced by 20-30%) but also harder. With proper bonding the honeycomb structure adds significant rigidity to the glued panel for a top that is stiffer than an equivalent solid piece of wood. Since the honeycomb is virtually impervious to dimensional swings and the multiple points of contact and support ensure that cracks are mitigated and practically cosmetic with the overall lamination providing support. With all these reductions in weight and benefits to strength double-top soundboards have less mass to dampen volume and response, enabling an even wider range of dynamic response and touch sensitivity while still providing a tone within conventional ranges. The tonal signature of double-tops tends towards a more woody and transparent sound with round basses and sweet trebles but still with ample overtones and complexity. Western Red cedar is typically chosen for both skins since it offers the lightest possible weight and capitalizes on the benefits of double-top construction, but spruce can be used on one or both surfaces as well, with cedar generally bringing out the midrange and crispness while spruce sweetens out the tone and favors more low end. While double-tops are likely not an ideal choice for a vintage or bluegrass tone, the added clarity and separation makes for a well-rounded and adaptable sound that can work in a wide range of other styles and venues.